Metalsmith and jewelry designer, Erin Bowe is the Hatch featured artist for June. She favors nature inspired pieces using sterling silver, copper and beach stones. 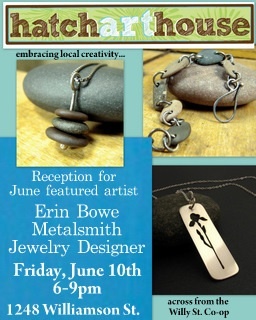 Erin will be bringing in even more jewelry for her reception, Friday June 10th, 6-9pm. Should be a fun night! We’ll have wine and beer to quench your thirst and seating outside to enjoy the summer-like weather we’ve been having. There will also be plenty of gift ideas for Father’s Day (June 19th). There is a parking lot behind Hatch, off of Baldwin Street, for easy access. See you Friday!